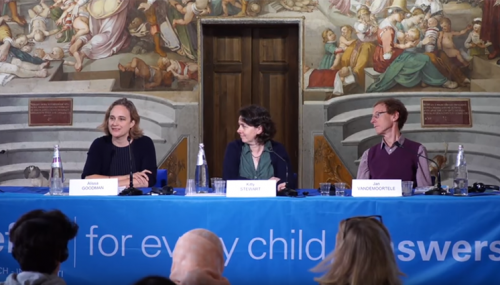 Equal access to quality education is not only important for children’s individual life chances, it’s vital for their future participation in society, Professor Alissa Goodman told delegates at a UNICEF event in Florence, Italy in October. Professor Goodman was part of a discussion panel launching the UNICEF report, ‘An Unfair Start: Inequality in Children’s Education in Rich Countries’. The study examines educational inequalities in 41 of the world’s richest counties, all of which are members of the European Union and the Organisation for Economic Cooperation and Development. “We recognise intuitively what a formative time our school years are, and how important education is,” Professor Goodman told delegates. “Research from the studies that I run in London, which follow people across the whole of their lives, back this up loud and clear. Education is important for the knowledge that we gain and for the potential that it gives us for getting a job, but it turns out that from robust research from around the world that it’s hugely important for many more things than that. Researchers from UNICEF’s Office of Research–Innocenti found that children living in rich countries were not guaranteed equal access to quality education. Using data from the Progress in International Reading Literacy Study and Programme for International Student Assessment the report revealed that among children in less wealthy nations, such as Latvia, Ireland and Spain, there was less inequality in reading performance at age 15 than in countries with greater resources, such as the UK and the United States. The research also showed that large inequalities in children’s educational progress were linked to family background. Children who had one parent in a professional occupation had significantly higher reading scores than children of non-professionals. The report further illustrated these findings using Millennium Cohort Study research showing the extent to which UK parents’ English language skills are passed on to their children. At age 14, the study members and their parents completed a vocabulary test measuring their understanding of 20 different words. The research showed that children of managers and professionals chose 1.3 more words correctly, on average, than children whose parents worked in routine and semi-routine jobs. Read the report, ‘An Unfair Start: Inequality in Children’s education in Rich Countries’, and watch the launch event on YouTube.